Yesterday morning at seven-thirty, I went for a walk. The sun was streaming down Evanswood, turning the street into a golden river of light. 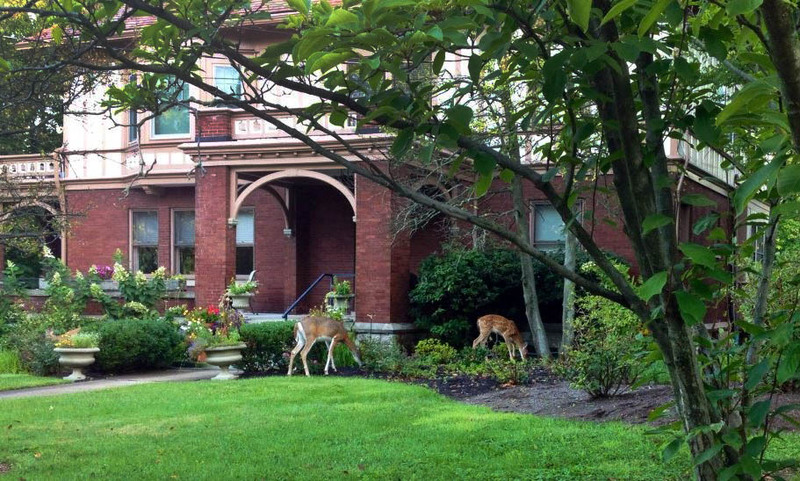 Across that river, in the neighbor’s front yard, a trio of deer placidly munched hostas, unbothered by the dog walkers and the pack of school children milling at the bus stop at the corner. I snapped an iPhone shot of the deer, a slender chesnut doe, and her twin fawns, still wearing their star-speckled coats. I felt sad and happy all at once. I love deer. As a child, I obsessively drew pictures of deer. Bambi was my favorite book. Deer were shy and quiet, like I was, yet they were also swift and mysterious and tapered. I still think they are the most elegant creatures, with their long legs and big dark eyes—the Audrey Hepburns of the animal kingdom. Yet standing there, watching them devour what was left of the Shapiro’s lilies, I felt sad, too. Because seeing deer in the neighborhood is no longer a novelty. They are everywhere. Their numbers are growing and there’s nowhere for them to go. My gardening friends mourn the loss of their hostas, and I get that. But: the deer. They have nowhere to go, and whose fault is that, exactly? A couple hours later, I drove off on an errand. At the intersection of Martin Luther King and Central Parkway, a young woman stood, holding a sign that read “hungry & homeless.” She was tall, thin, sun-browned, her face already a little leathery though she couldn’t have been much past thirty. I thought of that famous photo, you know the one I mean? That one of the sad-eyed depression-era migrant mother, her face a map of her worries? I’m famous for never having cash on me, but earlier I’d found a ten dollar bill while loading the washer, and I’d shoved it in my pocket, feeling pleased. I looked at her, motioned, rolled the passenger window down. “Thank you,” she said, taking the crumpled bill. And then, as she realized it was a ten and not just a dollar, her whole face lit up. “Bless you,” she said, joy transforming her face, stripping away years, until I could imagine her in high school, dreaming of her future. Maybe she’ll drink it or shoot it up or something. Or maybe she’ll get to eat a good meal. Not my call. One thing I know for sure, she didn’t grow up dreaming she’d be standing in the hot September sun next to an interstate and a White Castle, begging. There are so many in this world, with nowhere to go. I drove away, wishing I’d found a twenty, or maybe two twenties, folded carelessly together and left in the pocket of my walking shorts. That happens sometimes, when you have as much as I do. I wondered if I’d have handed it over, had it been twenty dollars, or forty, and I hoped that I would have. This entry was posted on September 10, 2014, 9:12 am and is filed under musings, photography, Uncategorized. You can follow any responses to this entry through RSS 2.0. You can leave a response, or trackback from your own site. A well-expressed mirror of my sentiments, Elaine. All this living in denial takes a toll on me. The reality that the needs are monumental, the problems complex, and our own personal resources, be them money, time or energy, are limited, can be immobilizing at times. Ergo denial. Good post. lovely and true on many levels. Thank you.